Great location, the apartment cozily host 6 people and although it is located in 1700 building the flat has been recently renovated and refurnished. Everything you should see in Rome is at walking distance. Situated in the heart of the city between Piazza Navona and Pantheon, Nice Apartment Navona Sq. is on the 4th floor (with private lift) of a 18th century building. The apartment has air conditioning and wifi connection. 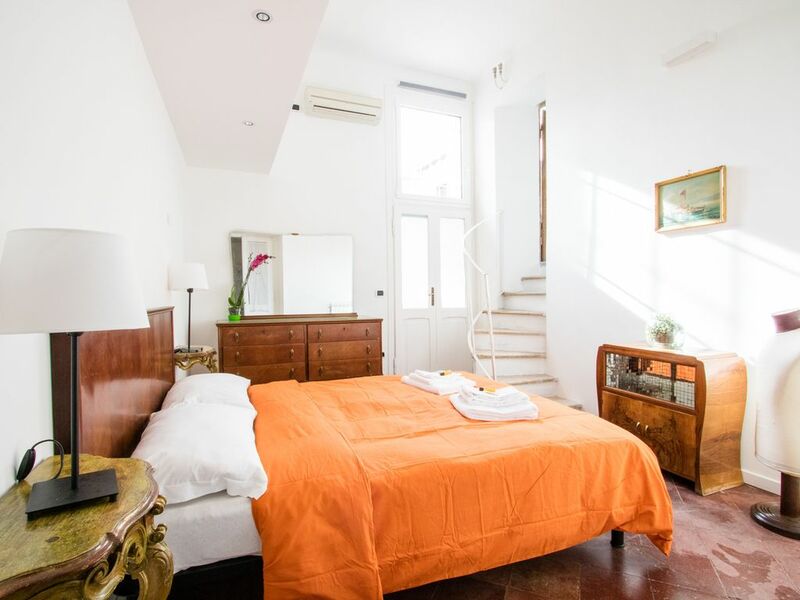 Perfect Location to reach all the main attractions like the Pantheon, Piazza Navona, Piazza Venezia, Largo di Torre Argentina. I was born in Rome 40 years ago and today I am mother of two beautiful children. After almost seven years of experience in London, where I have always worked in multi-ethnic environments, I returned to Italy and worked for 9 years in a company that operates in the context of UNITED NATIONS peace missions. I traveled frequently in my life and that's why I like to think of this work as an opportunity to transfer my experience and my passion to our guests, trying to provide an alternative service, efficient that has as main purpose to feel Traveler at home in a magical atmosphere that Rome, the eternal city offers to every visitor. Great location. Good space. Alexia and Roberto were welcoming, understanding, and accommodating. We used their recommended car service for airport transfers and for a day trip to Pompeii and Herculeum. The apartment was centrally located, quiet, and convenient. The configuration allows for 3 sleeping areas, and the compact kitchen works well for meals. Roberto was quite helpful in getting us set up, arranging transportation, and making sure everything worked. WE HAD A GREAT EXPERIENCE IN ROME, AND ALESSIA AND HER CREW MADE US FEEL RIGHT AT HOME. THE APARTMENT WAS AMAZING AND CENTRALLY LOCATED. IT IS IN A GREAT LOCATION AND HAS ALL THE AMENITIES THAT YOU NEED. WOULD DEFINITELY RECOMMEND AND USE AGAIN! This apartment was a perfect fit for our family of 5. Communication was great leading up to our visit and we were kindly greeted upon arrival. Apartment was clean and had everything we needed. The location is ideal for walking, although bus and taxi stands are very close. My kids loved playing in Piazza Navona at night. Plenty of food choices nearby. Great inexpensive panini shop at the building’s entrance and the BEST gelato in Rome has a shop a couple blocks away, Gelateria dei Gracchi. My only complaint is that the dryer only dries clothes half way. As dryers are very rare in Italy, my guess is that it isn’t vented. Not a big deal if you plan for that, but the apartment description should be amended so guests don’t plan on it. I’ve already recommended this apartment to a friend and will continue to do so. It’s a perfect place to stay while in Rome! I can't imagine a better, central location from which to enjoy all of Rome's wonders. Very easy walking most places; and when not feeling up to a walk buses are directly in front of the building. Apartment was very clean, very nicely fitted out and exceptionally comfortable. I'm already planning a return! We had a super stay at this apartment across the street from Piazza Navona. Three double beds, two bathrooms, kitchen. Great for our family. Man who checked us in was super helpful and kind. I found it strange that we were informed at check-in that a plumber was coming on Saturday morning at 10am. Not that big a deal, but I deal with plumbing issues at my own apartment and I didn't expect to be dealing with same (even just a plumber/technician visit) when I was in Rome for a weekend. Small issues: No sheets for sofa bed that we were going to use for Saturday night and Saturday morning we did not have hot water for a shower. I contacted owners/management company, and they took care of both for us on Saturday while we were out. Again, not big deals, and we had a good stay, and it would be more professional for these things to be taken care of when the maintenance charge is an additional 89 euro on top of total paid for two nights of stay. Great location and nice apartment. Dear Maureen, thank you for your review. I’m sorry that the cleaning company forgot to bring the sheets for the sofa bed and I’m sorry we had some plumbing issues while you were here. As you said, we are always really fast in solving this kind of issues but it was just an unfortunate coincidence. The maintenance charge on top of the total payment is actually a fee that covers all this matters in a really fast way (the plumber came fix the hot water boiler on a Saturday morning that is usually a non-working day) that instead of being included in the price of HomeAway, we charge upon arrival. It would have been the same, even more expensive for our guests to be honest, if we just let you pay that fee on HomeAway due to the service fee that the website applies to the total amount. Immersed in the heart of the historic center, you will spend your Roman holidays in a truly privileged position, with all the monuments and major attractions close at hand. All around the apartment winding charming alleys where you can breathe the most authentic charm of the city and you can "lose yourself" to the discovery of hidden squares, wonderful views and craft shops.